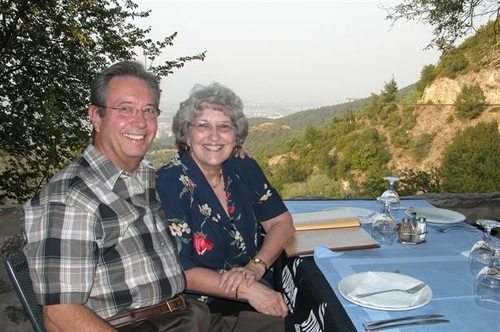 Thank you, dear friends, for sharing your adventures in Macedonia and Greece with us. We are mindful that you are getting ready for retirement (reader - see Ken's words below). However, until that time comes, please enjoy the beauty and the culture of that place for us. And do continue to send us photos of new adventures as they become available. NOTE: APRIL 12, RAY REPORTS THAT THE COREYS HAVE MOVED BACK TO LIVINGSTON AND THAT KEN IS NOW IN "SEMI RETIREMENT". See Ken and Carole's Thanksgiving greeting and his account of their Thanksgiving gathering in the comment section under "Current Events". Ken's words re retirement, sent in an earlier e-mail: "We are looking forward to retirement in Feb of 2008 to our home in Livingston, and fishing everyday until I can not stand it anymore". Postcript: While we have enjoyed so much seeing Ken in all of these photos (knowing that some of them required some athleticism on his part), acknowledgement of Carole for the time and attention she gave to writing all of the commentary and sending the photos along is appropriate. Thanks also to Ray for being the go-between when technology confounded our efforts!